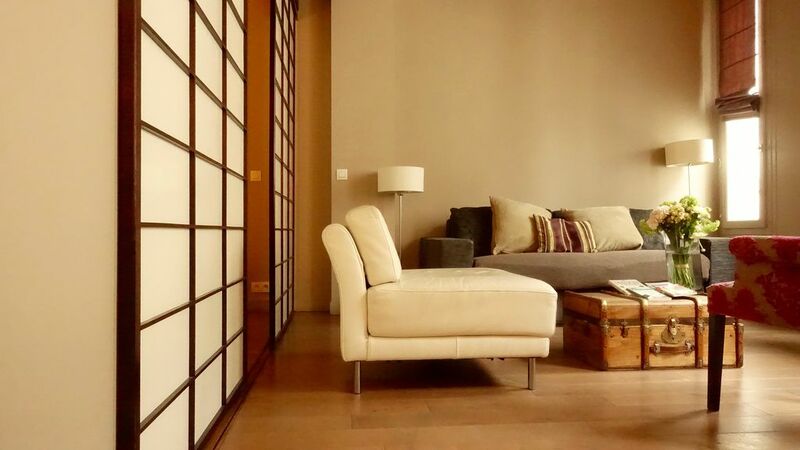 Of British origin, I founded my company ‘Pad A Terre’ in 1999 as an alternative to 4-5 star Paris hotels for a discerning clientele seeking more space for less yet no compromise on their usual standards of comfort. Our unique offer, consistent commitment to professional business practice standards and service, strict adherence to market regulations ensure us a nice position in the high-end segment of a mass Paris’s vacation rental sector. I have been working in partnership with Homeaway/VRBO since 2005. We are a French Registered company. All properties covered by the PARIS TOWN HALL VACATION RENTAL LICENCE (a legal requirement in Paris). ‘St Honoré’ sleeps up to 8 - comfortably. It comprises 3-double bedrooms (1 King size, 1 Queen, 2 singles/1 King-Size), 1 fully equipped bathroom with tub, stand-up shower and WC, 1 shower room with WC, drawing room/dining room (seats 6-8), fully- equipped kitchen with dishwasher, washer-drier etc. The apartment has air conditioning. ‘St Honoré’ has been renovated to the highest of standards to become very much a ‘luxury’ space at the top of the range in our properties portfolio. All ceramics imported from Italy oak wood floor work surfaces from the United States. Philippe Starck bathrooms and curtain materials are hand-made by ‘Toiles de Mayenne’, Paris. The property faces South, is bright and located on the 3rd floor of a quintessentially Parisian 17th century ‘timbered’ building. Beamed ceilings, traditional oak parquet floors throughout Walls are painted with natural tones, using paints from Belgium and England, made from natural pigments (Flament, Farrow & Ball). Beds are the most comfortable, bed and bath linens, Egyptian cotton of the highest thread count. The Louvre museum and the Seine are both literally a block away and the 6th and St Germain are just over the river across the pedestrian Pont des Arts, accessed via the Louvre’s ‘Cour Carrée’. Local Metro stations are Pont Neuf and Louvre-Rivoli (both a minute-walk – if that!). You will love exploring the area’s fabulous outdoor produce markets and the rue St Honoré’s ‘local’ artisanal boutiques for cheeses, wines, patisseries. We really loved our stay at this apartment. We traveled with our teenaged son and all felt like we had plenty of room to spread out. It was truly a highlight of our multi-city European vacation. We wanted a location that allowed us easy access to cultural sites (first time in Paris) but also let us feel like we were living like Parisians. This location is on a quiet street but so close to everything. There was a picture perfect fruit market on the corner, the best baguettes in Paris 100 feet away, a gourmet shop with amazing pate plus 2 food stores within a few minutes walk. We felt very safe here. We were only 2 blocks from the Seine, the Louvre, St. George Pompidou and were surrounded by great cafes. Notre Dame and the other sites on the island were a quick 10 minute walk! The kitchen was well stocked and we enjoyed making our own fresh coffee and breakfast each morning. The towel warmers were a huge benefit when we needed to dry our clothes faster than the dryer would. The manager/owner of this flat is very responsive and provided us a great check in experience. Our greeter was able to show us how everything worked and even contacted us to let us know we could enter the apartment a little earlier than expected! Post visit, I gave personal feedback to the host and again he was gracious and responsive. One personal suggestion if you are traveling with teenagers or anyone who is adventurous -- consider getting the App that allows you to log into an electric razor scooter. They are on any random street corner. It really made the trip fun for our 18 year old. My husband and I would go for a walk with no destination in mind, tell him where we ended up and he would come and meet us by scooter. One last note which we didn't consider before we chose this flat is that it is on the 3rd floor with a very charming staircase that rose in a spiral pattern to reach it. It was perfect for the experience but helpful to be aware of. Many other flats we considered were on higher floors. Overall, I would certainly consider this flat and location again. It was a pleasure staying here. Very clean and comfortable, perfect location! Located in the heart of it all! Cafes, shops, and sites are all within walking distance. Quiet 3rd floor unit, very comfortable, and very clean! Several amenities are provided. It was so easy and wonderful to work with James, we will definitely stay in this apartment again!! We just returned from a wonderful 5 night stay. The location was so convenient and we truly enjoyed being in close proximity to everything we wanted to see and do. James was incredibly responsive and offered great tips on restaurants, markets etc. If we are lucky enough to return to Paris again in the near future we will certainly be in touch with James to book again. Nice apartment, Great Location, easy check in and out. We were a group of 5 women, 2 Moms and 3 adult children. Outstanding location for us. Easy access to the Metro, Louvre, Tuileries and Marais. 3 bedrooms and 2 bathrooms were perfect. We enjoyed having a gathering space in the apartment. We had a great 5 day stay in Paris with a family of 5 (parents and three young adult daughters). The apartment was spacious and so convenient to all areas of Paris. We loved the super fluffy thick towels and all the other amenities that were provided. We liked exploring the varied neighborhood restaurants. Communication with James was excellent and he was able to accommodate our early arrival to drop off bags easily. I would not hesitate to recommend this apartment. I hope to come back again! Comfortable apartment for 4 adults and 4 children and awesome location! Easy to check into the apartment- everything was clean and ready for us. The apartment itself had everything one could possibly need for spending several days in Paris and the best part was the location- close to everything! Shops, museums, cafes restaurants. We definitely would consider returning there! Thank you!